Properly nourished pets live longer, and can save their owners over $4,000 over the pet’s life. From puppy and kitten, to senior adult, your pet’s nutritional requirements are ALWAYS changing. Even an adult pet’s nutritional needs change immediately after neutering. Caloric needs increase when a pet is pregnant, decrease a little during weaning, and change when pets leave their city apartment for the family’s week-long vacation at grandma’s farm. And to think pet food companies want you to trust that the food portions printed on the food bag exactly what your pet should eat at every meal. Let’s dive right in. I’ll wager a bet that most pet parents don’t know how to feed their pets the right foods, or the right portions, and I’d probably win. We at Unicorn know that every pet needs the right type of food in the right daily portions if they are to remain their healthiest. Pet parents are challenged with knowing when and how much the nutritional and caloric requirements change for their particular pet day to day, or throughout their pet’s life. I’ll try not to get too technical, but this is important, and I don’t want to lose you. Your pet (just like you) needs a certain number of calories (energy) to replace the calories it burns each day. Give them too many calories, they get fat and die earlier. Give them too few, they will always feel hungry, and they’ll suffer nutritional deficiencies. So, your pet needs calories. But they also need nutrients, like protein, fiber, fats and other essential vitamins and minerals. How much? Puppies need more protein for muscle-building than adult dogs, but senior dogs may need more protein than younger adult dogs because their old bodies may not process protein as efficiently. Here’s another simple concept: pets need nutritious calories. Calories and nutrition (or “diets”) are tricky. We know that obese pets need fewer calories to lose weight, skinny pets need more calories. That’s common sense, but if you feed your obese dog nothing but low calorie celery to lose weight, they would be robbed of vital nutrients. So, feeding correct portions (calories AND nutrition) is a perpetual balancing act! For example, you should expect to feed at least four different food types to your pet throughout its lifetime – each food formulated for age-appropriate calories and nutrition for each of the four life stages. But it’s not obvious when your pet enters each of the life stages, and it’s difficult to know precisely when to start feeding it a different food. Larger breeds can enter their “senior” stage at about 3-4 years, while smaller breeds become a senior at an older age – about 8 or 9 years. Every breed ages based on different life stage models, and every different pet within the breed will have unique nutritional needs based on individual physiology, activity levels, and more. Let’s back up a little and look at how a pet’s caloric needs are determined in the first place. Here’s a little “new math”. If your dog works on the farm, it will need about four times the calories of a similar house-bound dog, and if your pet is pregnant, she will need about three times her regular caloric intake during the last 21 days of pregnancy. 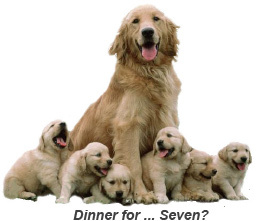 Humm … your pet food bag instructions don’t mention anything about feeding working or pregnant dogs. It DOES get complicated! Hang with me as I try to simplify it. 1) RER: or Resting Energy Requirements – the minimum calories needed to sustain life when doing nothing. 2) MER: Maintenance Energy Requirements, or RER plus activity-related metabolism – the total calories (energy) that pets burn when they do the daily things pet do – like chase a Frisbee®, work all day as guide dog, or just hang around the house. While RER only changes a relatively tiny bit over the course of years, MER can change daily, weekly, or monthly. Here’s a simple example: Just like human twins, if you have identical 30 pound twin dogs, both pets will have nearly identical RERs, but if one pet is more active, it will have a higher daily calorie requirement (MER) compared to it’s lounge-around twin. That makes perfect sense. Your pet food bag feeding instructions may say, for example, “feed a 30 pound dog 1 to 1-1/2 cups of food”, that could translate to “give your dog 400 to 600 calories” depending on the caloric content of that brand of pet food. Wow! That’s a huge difference. 600 calories in 1-1/2 cups is a 50% INCREASE over the 1-cup recommendation. How are you supposed to know whether the correct portion is 1 cup or 1-1/2 cups? Do both pets get 1 cup, or 1-1/2 cups? Is that enough for each, or too much? What’s a pet parent to do? There’s no easy way to determine how much more exercise one dog is getting on the farm compared to the other one lying around in the apartment. So, without any solid data, you just take a guess. This complicated issue is one of the driving forces that lead Unicorn to create a simple solution for pet parents that I’ll explain in a few moments. You can now share our disappointment with the state of the pet food industry. Even when informed pet parents follow the feeding instructions printed on pet food packages, pets are usually overfed. That’s why more than half of the nearly 200 million pets in the United States are obese. It’s unfortunate that pets can’t talk, otherwise they would tell us that they are obese and miserable, and that they’re suffering from obesity related illnesses – like diabetes, for instance. I’ll tell you later how Unicorn technology “talks” for your pets. It’s not that big pet food companies are telling pet parents to over feed their pets as a “sell more food” conspiracy. It’s just that they can’t possibly know exactly how much food each UNIQUE pet should be eating, so they only provide general feeding guidelines – which, as we can see, fall short. So, how many calories does your pet really need? To figure that out, you first need to establish the resting metabolic rate, their RER. After that, we can add in the EXTRA calorie requirements your pet needs to support their daily activities – then we arrive at their MER. RER can be determined using a few different methods, but we’ll show this one formula – don’t be intimidated. Here’s what that formula means for a 10 pound dog. The dog weighs 10 pounds – equivalent to 4-1/2 kilograms (kg). Then, (70) x (4-1/2 kg) multiplied to the 3/4th power equals about 218 calories per day. The RER is then 218 calories. Whew! Then we use a second chart using generally accepted multipliers to determine the real world daily caloric requirement. As you can see in the chart below, if your dog is a neutered adult, you would multiply the RER that we determined above (218 calories) by a factor of 1.6. The resulting MER is 348 calories per day. That’s how many calories to feed your pet each day. Oops! You took your dog to play Frisbee® at the park for most of yesterday. He was running vigorously for 4-5 hours! More work = more calories! So, for yesterday, you would have multiplied the RER (218 calories) by MER factor “3” (moderate work), arriving at 652 calories – but just for yesterday. For today, it’s back down to 348 calories. OK. So this exercise in calorie mathematics is not intended to be a “Pet Food 101 class, and NO – there won’t be test at the end of this article. I’m merely trying to illustrate that proper feeding is really complicated, and feeding pets with such precision is something that could be expected in a controlled laboratory environment, but not something that the everyday pet parent can accomplish. We’ve all heard about human diets that say we can lose weight by eating foods with “empty calories” – like celery that takes more calories to chew than it delivers to the body. The same concept holds true with pet food. Calories alone do not define the food. If your pet needs to lose weight, you can’t just reduce calories since that would rob them of the important nutrition they need to maintain a healthy body. I’m not going to do a deep dive into explaining protein, fat and other vital food nutrients, but it is important for you to know that specifically engineered pet food recipes (nutrients per calorie) do exist, and are generally tailored to specific breeds, ages, or other criteria. But understand that feeding instructions for these foods are still generalized and simply can’t be accurate for each unique pet. That’s why the United States Food and Drug Administration (FDA) and the Association of American Feed Control Officials (AAFCO) work together to ensure that pet foods meet minimum quality and nutrition standards. AAFCO analyzes pet foods to ensure that they meet a “guaranteed analysis”, which means that the so-labeled pet food is “guaranteed” to meet the minimum percentages of crude protein and fat, and maximum percentages of crude fiber and moisture. When you see “complete and balanced” on a pet food label, then AAFCO has analyzed that food and created a nutrient profile that shows the pet food as meeting minimum nutritional adequacy. Nutrition and quality are so important that the FDA and AAFCO have also teamed up to create manufacturing standards for pet foods – called “Good Manufacturing Practices”, or GMPs. These guidelines recommend quality standards for production equipment, chemicals, lubricants, pesticides, fertilizers, manufacturing processes, procedures, records, and much more. Be aware that any given pet food, even if it is AAFCO listed, may not be the right food for your pet. If your pet has aged past its adult prime, it may need a “senior” pet food. Your older pet is not as active as it was when it was a puppy or kitten, and now it needs fewer calories (lower MER). But, older pets may need more protein if their tired bodies don’t process protein as efficiently. Many other ingredients may need to be adjusted to optimize nutrient take up by older pets. So, to keep your senior pet healthy and trim, you can’t just cut the calories of a food intended for a young, active adult or they will be robed of vital nutrients needed in later years. Pets should eat age-appropriate food. Then, remembering the MER factors, even the age-appropriate foods need to be accurately portioned each day. Growth stage, adult stage, senior and geriatric stage. RER, MER, activity related calories, feeding pregnant or lactating dogs, working dogs, fat cats and lazy dogs. Breed related life stages, overweight, underweight, weight loss and weight gain diets. YIKES! All of those variables (and many more) made us want to scream, too. As pet parents, we found it nearly impossible to create the perfect daily meal for our own pets. So, we created Unicorn to solve that problem. We’ve spend the past few years “doggedly” developing and patenting literally dozens of new, ground-breaking technologies related to pet food, food and water feeders, activity analyzers, food packaging, individualized pet nutrition profiles, and more. Unicorn is the only pet food company that eliminates ALL of these crazy but important variables from daily feeding routines. Our technology automatically makes all of the food, calorie and nutrition changes for your unique pet related to each of its life stages. We help you feed your pet the PERFECT DAILY PORTION without even thinking – so it can live happier, healthier and longer. 1) You download an Android or iOS phone APP (or login to the Unicorn website). Then, you set up a profile for each of your pets by answering a few questions – such as name, age, breed, gender, neuter status, and the like. 2) Your pet profile is stored on our Unicorn Cloud servers where we compute your unique pet’s RER and MER, and customize a daily meal portion using nutritionally optimized age-appropriate food. 3) Then, we send you two weeks of food every two weeks. Our Magic Meals™ are ultra premium pet food delivered in 14 pre-filled daily meal packs that are calorically and nutritionally customized for your pet. 4) We also send you a wireless smart feeding platform – a beautiful feeder that replaces all of your crusty old food and water bowls, and monitors your pet’s food and water consumption every day. The feeding platform is Bluetooth connected to the Unicorn APP on your smartphone. 4) Unicorn also has an activity collar that replaces your pet’s old collar. It’s a wireless smart collar that records your pet’s daily activities – the ACTUAL MER activity. That’s important information that we use to compute the actual calories you pet needs each day. Then, throughout your pet’s life, our Unicorn Cloud servers continually analyze your pet’s current age, life stage, activity levels, food and water consumption and changes – and keeps your pet’s nutrition program perfectly up-to-date. The interesting thing is that most all of this nutrition and activity monitoring technology is FREE. Ordering Unicorn food for your pet is like ordering your chef-prepared meal at a 4-star restaurant. YOU ONLY PAY FOR THE FOOD, but you use the plates, utensils and napkin for free! Your pet is a one-of-a-kind family member that you will care for its entire life. 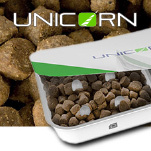 Unicorn is your one-of-a-kind pet food company that delivers properly portioned meals customized for your unique pet, using our patented and patent pending nutrition technology. We’re committed to helping you optimize your pet’s lifetime nutrition. So you finally have a pet food company that takes the mystery out of daily feeding, and the only pet food company that also provides the total health and nutrition technology to help your pet live happier, healthier and longer.